Replacement 3.7V 140mAh Battery for Plantronics 84479-01 & 86180-01 for Plantronics CS540, CS540A & CS540-XD Wireless Headsets. NOT compatible with other headsets including the Plantronics Savi W740, W745, CS50 or CS55 (this battery is only compatible with the CS540, CS540A & CS540-XD headset). Replacement for: 86180-01, PL-86180-01 & 84479-01 Plantronics Battery. Compatible with the following models: Plantronics CS540, CS540A & CS540-XD headsets. 3.7V 140mAh 0.55Wh Li-Polymer Battery. Provides up to 7 hours talk time on a full charge. 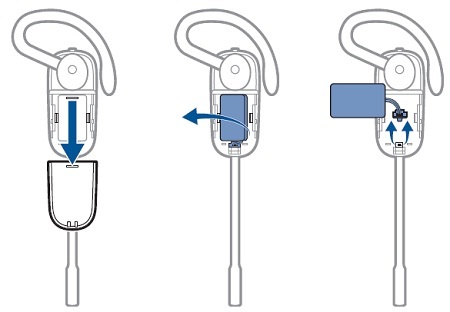 Slide off the battery cover and remove it from the headset. Pull out the plantronics headset battery from the attachment clip. Disconnect the battery connector from the headset. Plug the replacement plantronics CS540 battery (plantronics p/n 86180-01) to the battery connector. Once the CS540 replacement battery is connected, slide it into place. Slide the battery cover back on and push it into place. Fast delivery. Product is as described and fit perfectly. Just installed it; seems to hold a charge for quite a while. This will extend the life of our headsets for another two years, hopefully. I have found that this is an excellent way for me to receive a product that I need and it was exactly what I needed. Ordered these for spare/back-up batteries for when original's die. Used in Call Center Wireless Headsets. Had to rate at 4, because I have not charged or used them yet, but order, service and delivery was excellent. Click the button below to add the 84479-01 86180-01 Battery for Plantronics CS540 CS540-XD Headset to your wish list.